An LNWR TPO, but apparantly only a single postal carriage. The following coach looks to be non-corridor. The engine is hidden but there look to be two other carriages ahead of the TPO carriage. Perhaps stock workings might give a clue, along with the footbridge and house beyond. The line curves to the right of the house. S.R.S. is presumably the photographer who is not known beyond the initials. Date c1905. There is a bag at the bottom of the receiving net while the catching net on the Post Office carriage looks to have caught a bag which has yet to reach the bottom of the net. Where might this well captured action be taking place? The Post Office would appear to be of D.397, which had two vehicles, Nos. 6 and 7. In 1907 these were both assigned to the Euston-Crewe Midday Mail service. This train made lineside mail pick-ups at quite a number of places, but I have no idea where this was taken. This looks to be posed as there is no movement of the train. Also, the carriage to the right is a (32ft?) non-corridor with a Third Smoking compartment at the end, so not using the side corridor of the TPO. I think there are at least four vehicles in front of the TPO (I assume we are looking towards the front of the train) and none of them obviously for mail, parcels, tender etc. So probably they are not using the side corridor either. So, maybe it is a collection of carriages to hand assembled for the picture — i.e. not far from Wolverton? Otherwise, not a clue! If it is posed then how was the mail bag seemingly captured before it has reached the bottom of the net achieved? But the train may have been moving slowly. The reference to side gangways is not understood — these would only couple to other Post Office and Parcels vans, and not to ordinary carriages. There is a trunking run in the foreground which might suggest a Crewe all electric system is installed in this area. How long did the Chain Brake rings on the cant rail survive? The rings for the Harrison cords train alarm apparatus often remained in situ for several years. It is not unusual for a carriage still to possess them in 1905. 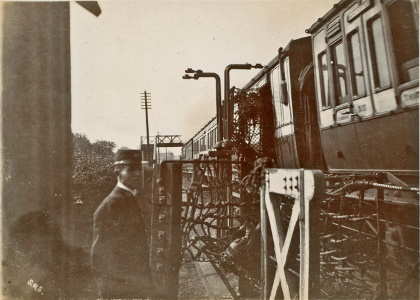 The marshaling of the train in this photograph is interesting inasmuch as there are passenger-carrying vehicles ahead of the TPO. This was surely against normal practice as the TPO and the attendant vehicles were always the leading vehicles on any train conveying passengers. This to protect passengers from putting heads out of moving trains and the dangers of injury and death from contact with hanging mail pouches. All the photographs that I have seen always show that this was the normal marshaling of trains conveying TPO vehicles, so I cannot explain what was happening in this instance.It is indeed a mystery photograph in more ways than one.